The blog tour for this book (and her other children's books) is running through April 22nd, 2013. You can enter to win $500 in Amazon Gift Cards (DOUBLED if you review them!) and a Kindle Fire. Tour page is found here: http://www.candacesbookblog.com/2013/...If I was a teacher I'd be all over reading this book aloud to the class. This book is SO fun to read aloud! I actually announced to my 4 year old we were going to read a story so I could read it one more time before I wrote this review. I was SO into reading it and making those words just POP. The words are in verse and all flow so well. All of Stephanie Lisa Tara's books shout to be read aloud (even her middle grade book, Eliza's Forever Trees) but this one was maybe the most fun out of the books I read today. This is a book that any book lover will connect with. So as an adult you'll be saying "YES!" in your head the entire time. Books do bring you to amazing places, you can experience ANYTHING in a book! The illustrations are very cute. There's an illustration on the opposite page from the words that's full color and gorgeous. On the page with words is a more simple black and white illustration. These are simpler illustrations from her other books, but I liked them just as much. And I think the words are easier to read for those who are just learning to read since they aren't flowing over the page like the others, but are in paragraph form all together. Like all of Stephanie's books there's a Lesson Plan in the back for activities you can do with your children that are related to the book. I really like this in all of her books because doing things other than watching TV and playing video games is always a plus. Getting together to do family activities is great! I very highly recommend this book! Four stars: A wonderful adventure that shows where books can take a young reader.The library closes for the night. In the shadows awaits a curious mouse. He nudges open a book and experiences the wonders that await in the pages. Where can he travel while reading a book? Who can he be? What can he do? What is waiting inside a book? As the night unfolds, the little mouse shows a young reader all the magical and wondrous things that they can encounter while using their imagination and reading a book. This little tale is told in rhyming verse and is accompanied by bright illustrations. This is a great story that will hopefully stir the imagination and encourage a love for reading. I liked that at the end of the book the author includes a lesson plan with directions to make a library card and discussion ideas for the [email protected] Day Ramblings. In the simple rhyming text here a little white mouse describes the types and genres of stories he and his sister mouse read after the library is closed for the night. Alex Walton draws the cutest mice--the boy mouse with his blue bow tie and the girl with her little red bow, with curling tails and whiskers. However, I didn't care for the mouse man who seemed to be coming out of the books to tell them stories, because he had a mouse head but the body of a man. I would have preferred a dressed-up mouse. Anyway, the colorful and bright illustrations help describe the emotions and ideas that the books inspire in the two mice. The story is obviously written to inspire kids to go to the library and read books--a bit too obviously didactic for me. Nonetheless, cute and sure to appeal to younger readers. A sweet little story poem about reading. I love the illustrations too and I must admit that I often buy books just because I think the illustrations are pretty. I have now started downloading children's books onto my ipad because I am hoping that my son might prefer them to real books. Sadly I can't get the kid to show any interest in the gorgeous books in his bedroom! But maybe he'll like them if he can turn the pages by swiping his finger over the touch screen! My Thoughts:I have to say Little Library Mouse has become one of my all time favorite story books. I absolutely loved this story so much due to all the creativity among its pages! The illustrations captured my eyes with love with their old school charm and the rustic narrator mouse that graces the pages. This book could make even the most reluctant reader become giddy with the excitement over the adventures awaiting them in the library. Again, I have to tell you how much I LOVE the rhymes in stories. In fact, it is proven that children (my son included) learn easier and retain things much easier when they can put it into a friendly rhyme. The light prose that goes through the story puts your mind at ease as if you are floating along a cloud seeing different images in the sky. This was a warm funny and amusing story that teaches us having an imagination can take us anywhere as well as getting lost in books. I actually felt like Little Library Mouse was written in more of a poem format than your standard book format, which helped introduce poetry to young kids too. The stanzas in the book grabbed me with such intensity because of the flair and vividness of the words brought to life on the pages. I had so many favorite quotes from the story it is hard to pinpoint just one but I did think this one stood out for me and definitely for my youngest son for his love of rainbows:"I'm redI'm yellowI'm iridescent blue,Short stories are rainbowsof sharp color and hue." I love books that hold such magic for our minds and I absolutely adore children's books that can capture a child's heart and show them the thrill, the beauty, and the satisfaction of diving into a good book. Little Library Mouse is this book and I have become a fan for life of this story and our author, Stephanie Lisa Tara. I definitely recommend this book to young and old who love to read to go on an adventure with a very clever mouse and his little helpers. I give this book five hearts and more!!!! I had so much fun reading this book with my daughter. It is bursting with awesome illustrations full of imagination!! It inspires you to have a creative mind. As long as you have an imagination, you can never feel truly alone. Your mind is great company if you know how to use it right. This book is about a little mouse in a library all by itself with just the books. Instead of feeling alone, it steps into the pages of the books. It can be anyone or do anything as long as it can imagine it. We go through different books with the little mouse and become who and what it becomes. After a night of exploring the amazing books the little mouse knows that in books it can be any story it wants! This is a great book to let children know that it's good to have a creative imagination. The pictures are all so beautiful and fun and it made my daughter want to imagine being in different places and being different things. After reading this with her, she was excited to try and imagine all sorts of things and wanted me to read it to her again and again. This is a book that I would recommend to have on every daycare, school, and home bookshelf for children of all ages! Little Library Mouse is a book about a book lover's dream! Living inside a library and then inside the stories in the book. This story is a fabulous way to show young readers just how limitless their imaginations can be when they fall into a book! The words rhyme and make you want to get up and move about as you read. It's fun to read, to see all the books the mouse finds himself in and the vast array of things he discovers in books. The illustrations in this one are different. Black and white on the side with the writing and then the other side is full color illustrations of what the words are saying. It's a book meant to be shared. It's a definite read aloud, maybe a little acting the parts out kind of book.Again, lesson plans in the back suggest this would be a great book to introduce pre schoolers to the Library. What a fabulous idea! It says to ask who knows what a library is, has anyone been to one, does anyone have a library card, what can you do in a library and the most important question what can't you do in the library?! It has other plans as well. All very clever. So, what will you do, if someone gives you a key to the library and you own it for the rest of the night? More than what you will do, how will you feel? I know I will just be the happiest person in the world. A library, people - for you alone for the next 12 or so hours.. That will be so amazing. This book is about a mouse after the working hours of the library. Remember, this mouse loves books - well, not to eat but to read. It loves that the books takes it different places and gives the opportunity to learn many things. It loves that it can be any character or thing in the book and can live in a completely different world. It ends with an invitation for us to join..Its fun to read this short children's poem book. The illustrations are colorful and will be liked by kids. For book lovers, this would be absolutely relatable.Enjoyed this one! Recommended for kids who can understand short verses. I love, love, loved this book. I am a fan of libraries (obviously books are something I adores) and of cute little mice. Little Library Mouse is all about the stories and imagination and I found myself giggling as I read the beautiful verses. You can be anything you want to be as long as you put your mind and maybe imagination to it and the cute little mice sure do; they are chefs and clowns, and lions and tigers and the storytelling is adorable.The images again in this book, I'd say are better than in Snowy but their purpose is also more playful and vibrant while the other book instructs. I think these mice have a great lesson too, that books and imagination are important, and i was happy to read this book and will happily pass it on to some children I know will love it too. The excitement in the book, "Little Library Mouse" was very eye catching. This story was about A key that locks at closing time at the libraryand unlocks the dreams of a little mouse who waits in the shadows. Skipping, sliding, down the pages of books.He steps inside magical stories, inviting readers to come along for the ride. The age group for this story would be around ages 5 and up. The main artistic element that I loved was the color because although the color was dull it still had meaning into the pictures. I definitely would recommend this book because In the story it says, "Even when you are little, you can imagine big"....that is how this story begins. It just encourages children to take a trip to the library. I thought this was a charming little book. I actually got it for the kindle, the original kindle, which may have been an issue with my enjoyment. This is a book of very short poems interspersed with images that illustrated them. The images were very good but I wasn't able to see them in color on the Kindle, of course. The poems were apparently uploaded as images too, which meant I couldn't change the font size and the writing was quite small. So, I wouldn't give it great kudos for formatting, but the contents were quite enjoyable. I'm sure as a regular book read to little ones it would a hit. Reviewed by Jessica for Book Sake.My favorite of all of Stephanie’s books. This one spoke to me and the reasoning that I love getting lost in books. This story can inspire reluctant readers and show them what they can get from books. There are so many ways that this Little Library Mouse gets lost in books and so many characters it can be!Book Received: For free from author in exchange for an honest review. Little Library Mouse was a story that my children thought was cute and fun, and they liked it. I found it to be amusing, and we all enjoyed the illustrations. The verse was nice, and the rhythm made it easy to follow for the kids. Little Library Mouse was a charming story that really inspires the imagination. The text and illustrations work very well together and the message, that books are a source of knowledge and that imagination can take you any where, is a good one. The text is a little awkward and stiff at times but it's a delightful story. A fun book to share!Stephanie Lisa Tara book is perfect for sharing anytime with anyone. The illustrations are fabulous and funny. A new fan. "Even when you are little, you can imagine big"....that is how this story begins. A little white mouse hears the key locking the library door after it closes for the day. The mouse and his friends explore the contents of many different kinds of library books and imagine that they are characters in the stories.The story is written in a delightful rhyming prose that children will love. Each rhyme is written in five short sentences that include a wealth of book/library vocabulary words.Alex Walton has done an amazing job illustrating this story. The pages alternate between simple line drawings and full-page elaborate color illustrations. 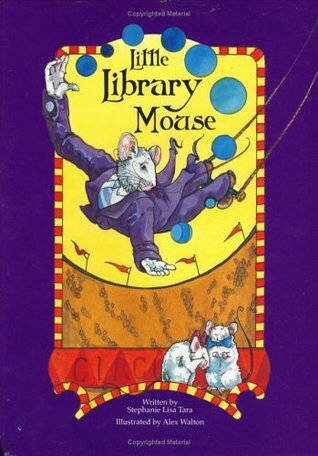 The color illustrations show a white mouse in a purple suit becoming part of the library book that he is exploring. Children will be enchanted by the details in the color illustrations.When I was working as an elementary school librarian, I was always looking for books that encouraged children to visit the library. This is one of those books! This book is an excellent resource for promoting the library to young children.I really like the way the author incorporated many library/book vocabulary words in her rhymes. This book is a wonderful introduction to words like "page", "rhyme", "poems", "sentence", "glossy", "fable", "paragraph", "verse", "prose" and "images".The color illustrations are outstanding. Children will be able to see much more in this story as they look at the pictures and use their imaginations.This book was published as a print book in 2006 and released as a Kindle book in February, 2011. I read this book on my Kindle 3 (black and white illustrations) and on the Kindle for PC Application (color illustrations). I think the formatting for the Kindle is very good and children will enjoy reading the book on the small screens of a Kindle, iPad, iPhone, etc. I think this is a wonderful selection for teachers and librarians to share with their entire class by using the Kindle for PC Application and a projector.This book is an excellent selection for reading aloud or independent reading. I highly recommend this book for children, teachers, librarians and parents. Text tooSmall on iPadI think this book might be good, but it was hard to tell since the print was very,very small on my iPad. And since I am a grandmother it helps to see what I am reading. A mouse lives dozens of different lives in the books of the library. A bit too abstract for both Asher (6 yo) and Dex (4 yo).Illustrations are colorful and engaging. Cute, quick read. I wasn't overly fond of the sing-songy rhyming, but the pictures were gorgeous! The color and detail were beautiful. Not a bad choice for a bedtime book for a little one. Clever pitter-pat of mouse feet through the library! CuteThe kids thought it was okay but it wasn't really something my five year old felt to interested in. He ended up fidgeting through the book more than reading. To me this book read like a poem with illustrations, and I really loved the way it felt. Poetry exploring imagination, with lots of cute details (like mouse footprints, paper airplanes, leaves, or snowflake fractals) around the words and cute full colour illustrations on the facing pages of each verse.